I have often heard and read about stalkers, the so called crazy people. That they haunt you and follow you like a shadow tearing apart the privacy wall you carry around yourself. But I have never heard or read of ideas or a trend stalking you…I have to admit that it’s something I have crazily been forced to declare. You will see it on the roadside, malls, posters, billboards, taxis, dhabas…name any space where, we Indians carve out our creativity for advertising and you will get a trace of the stalker. Recently on my way back from Select Citywalk, as we stop at the red light, a taxi pulls up next to us and there it was! It has been following me everywhere and keeping a tap on my mind. 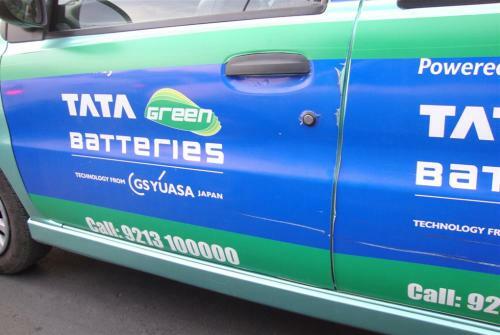 The ad reads, “Tata Green Batteries…” No way am I going to buy the mindset they seem to be selling out with the battery! Call it pseudo or a magic wand for advertising but the words ‘GREEN’ & ‘ECO’ are being abused so badly that I have to condemn this as a stalker. A new trend and wave of ideology has been sweeping among the masses for quite a long now…which I call the “Green-o-fever”. My mind finally gave up to its infectious torture when I behold a billboard on the NOIDA highway to Ghaziabad which says “Supertech Eco Village – Roti, Kapda aur Eco-village”. I keep wondering who or what gave birth to all this tag…is it the Copenhagen summit? Though the summit had failed many hopes to save the earth and raised more alarms than any solutions. One thing it seems to have succeeded in is creating awareness about climatechange in such a manner that without reasoning & understanding people have bought the popularity rather than the desired attitude of change. Thanking the ‘democracy’ we so love to adorn this country with, I have raised my concerns and expect to work it out more clearly with further analysis of the cause and symptoms of the fever. We have the freedom & right for expression…but before freedom, discernment should come! A beautiful mind is what saves the world and it’s justly put in words in my favorite quote from the movie ‘A beautiful Mind’. “What truly is logic? Who decides reason? My quest has taken me to the physical, the metaphysical, the delusional, and back. I have made the most important discovery of my career – the most important discovery of my life. It is only in the mysterious equations of love that any logic or reason can be found. Love for nature and environment can only lead us to the way where we will find the reason and the courage to save the world from the impending judgment of climate change! Are you reasoning…?? It is true, in today’s world “Green sells”. There has to be some restriction on the word.